Lowest prices all the time, guaranteed! If you find a better price, let us know. 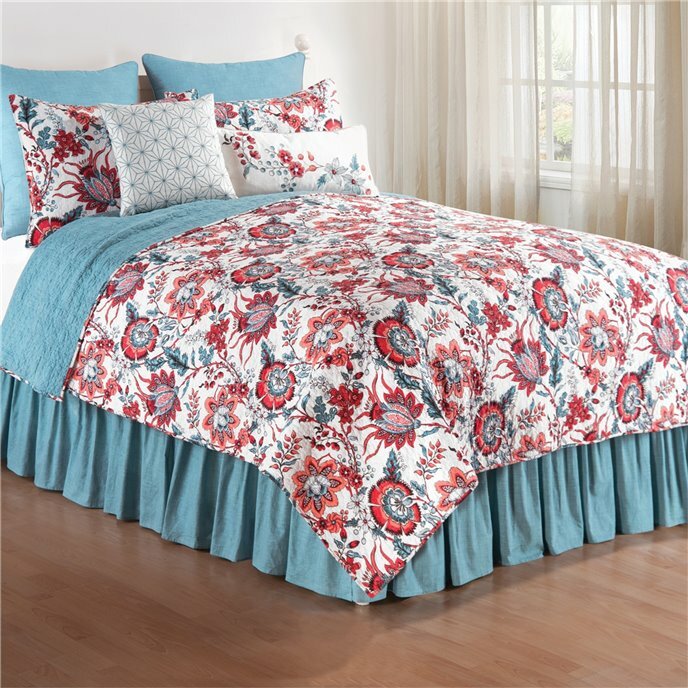 Adrienne Quilt bedding by C & F Enterprises is a Williamsburg design featuring Jacobean style flowers, branches, leaves, and berries in shades of red and blue on a pearl white background. Self binding trim. The quilt reverses to blue. 100% cotton cover and filling. Machine wash, line dry. The shams are quilted in the same print as the quilt. For added height behind the shams, add a euro sham with a grid design in Aegean blue. The bedskirt is also in the Aegean grid blue. Embroidered pillows for accent include a floral pillow and a geometric design. Adrienne Full Queen Quilt is a Williamsburg design featuring Jacobean style flowers, branches, leaves, and berries in shades of red and blue on a pearl white background. Self binding trim. The quilt reverses to blue. 100% cotton cover and filling. Machine wash, line dry. 90" x 92". Fits full and queen size mattresses. We offer the complete ensemble in the Adrienne pattern by C & F. Manufacturer's UPC code is 008246332770. Adrienne King Quilt is a Williamsburg design featuring Jacobean style flowers, branches, leaves, and berries in shades of red and blue on a pearl white background. Self binding trim. The quilt reverses to blue. 100% cotton cover and filling. Machine wash, line dry. 108" x 92". We offer the complete ensemble in the Adrienne pattern by C & F. Manufacturer's UPC code is 008246332756. Aegean Grid King Bedskirt has a grid design in aegean blue. 18" drop gathered split corner bedskirt. 78"W x 80"L. April Cornell design. We offer the complete ensemble in the Middleton pattern. Manufacturer's UPC code 008246331599. Adrienne Embroidered Flower Pillow has flowers and berries embroidered in blue and red on a white pillow with corded trim on the edges. Polyester/linen blend cover with polyester filling. Spot clean only. 12" x 24". We offer the complete ensemble in the Adrienne pattern by C & F. Manufacturer's UPC code is 008246332824.